JUST LISTED! 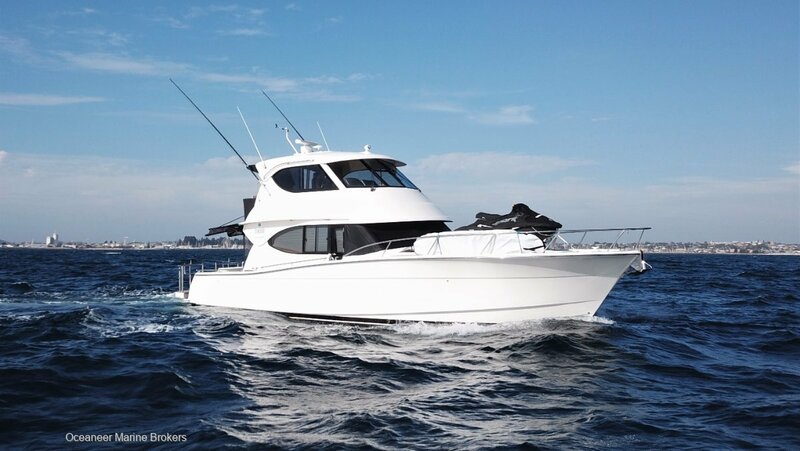 This exceptional 2008 Maritimo M48 is a testament to the owner. Highly specified from new including the desirable and costly option of a hydraulic swim platform. The M48 is a brilliant platform that will comfortably take a family and their guests for a weekend getaway. Three cabins, two bathrooms, aft galley, full size fridge/freezer, internal staircase and enclosed flybridge with ducted aircon. Low hours and full service history on the reliable and economical Cummins QSM11 670's. Bow & Stern thrusters, davit on bow. More information and images to follow next week. This will not last at this price, call Tom or Matt Lovelady on (08) 9243 6373 or email sales@oceaneermarine. Com. Au to receive more information and times available for inspection. accomodationPort master suite with own bathroom, forward VIP double with bathroom access, starboard bunk cabin with 2 singles. Convertible sofa in flybridge.